No matter how short your airport stopover in Singapore there’s always time for a cocktail and the city’s iconic Singapore Sling is one of the best. Made with gin, pineapple juice, cointreau and cherry liqueur, it’s best enjoyed with a handful of monkey nuts at the historic Raffles Hotel. Dating back to 1887, this opulent colonial-style hotel is a fascinating place to wander around and an absolute must-see if you’re travelling to Singapore. To get there ride the MRT (Singapore’s Metro system) from the airport to the City Hall stop in the heart of the business district. It’s then just a short 5 minute stroll to the hotel. A day pass for the MRT is just a couple of pounds but you’ll pay a little more for your fruity concoction. 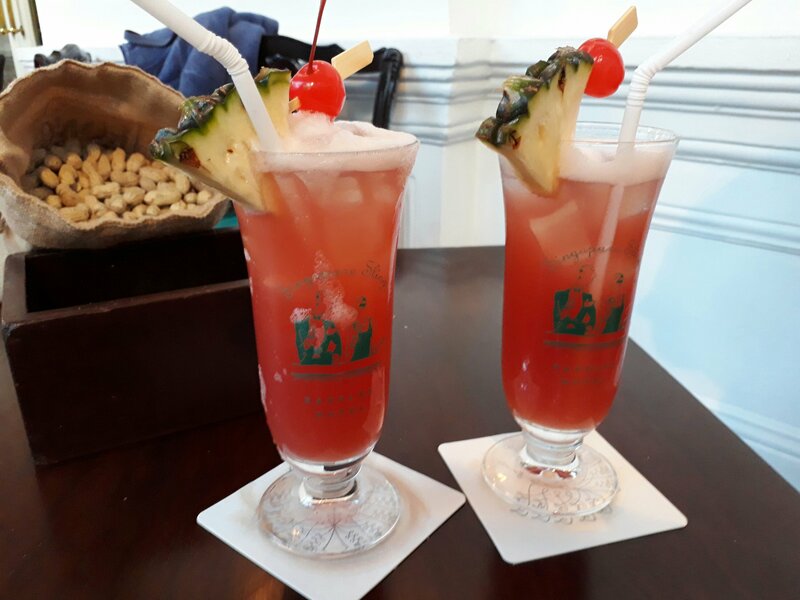 A traditional Singapore Sling at Raffles Hotel will set you back a hefty $35! 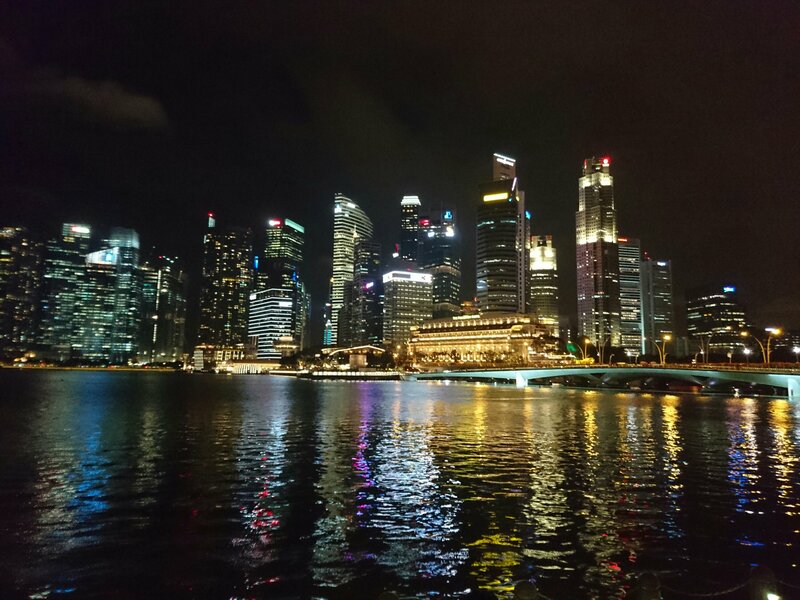 After a cocktail wander south past glittering highrise buildings to picturesque Marina Bay. Feast your eyes on the impressive nightime skyline reflected in the shimmering water then direct your gaze towards the enormous surfboard perched on three towers. Otherwise known as the Marina Bay Sands Hotel, Singapore’s most luxurious hotel puts on a spectacular free light show every evening. As you watch colourful laser beams projected onto the night sky in time to dramatic music your jet lag will fade away in a contended gin-induced haze. Light show over, hot-foot it back to the MRT and glide back to the airport where you can congratulate yourself on a highly successful airport stopover in Singapore! With an overnight stay you can take your time to enjoy the city and what better way to recharge your batteries between flights than an evening swim in a rooftop pool. 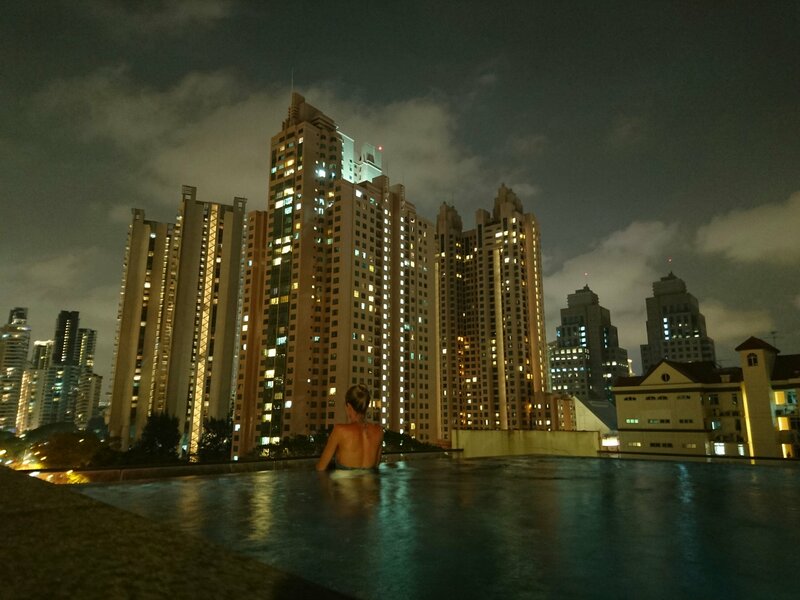 Singapore’s tropical climate and high volume of skyscrapers make it king of the highrise swim and there are some stunning pools to choose from. If you’ve got cash to splurge, Marina Bay Sands has the world’s largest rooftop infinity pool, with panoramic views of the city from 57 levels up. However you have to be a guest of the hotel to use the pool which will set you back an eye-watering $339 per night! For us mere mortals there is a budget alternative. A lot of city centre apartment blocks also have their own rooftop pools and happily many are rented out as holiday homes. 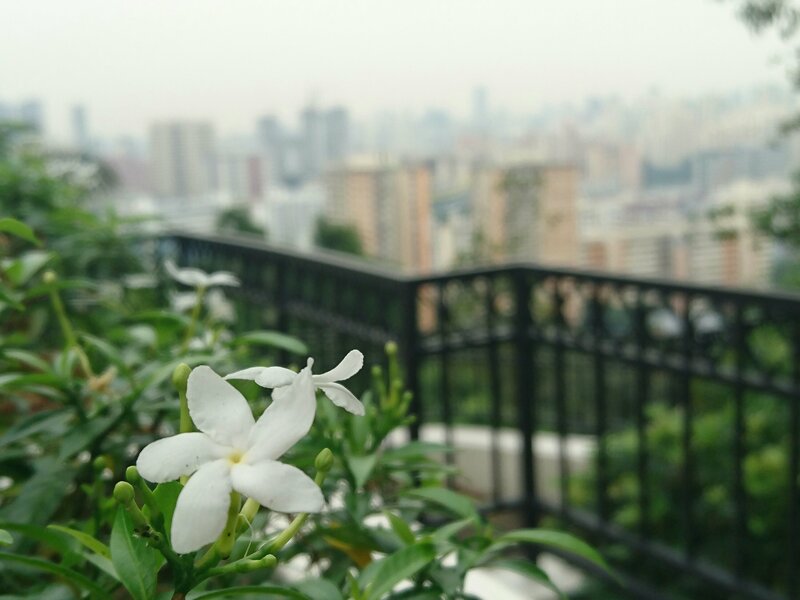 We found a small but perfectly formed apartment through Airbnb on River Valley Road, just 5 minutes from the main shopping area of Orchard Road. The rooftop infinity pool and jacuzzi were heavenly and almost always unoccupied as most of the building’s residents were local people out at work. It also had a gym and rooftop seating area, perfect for relaxing with a glass of wine after an afternoon of sightseeing. The next day, before returning to the airport, make a stop at world class Singapore Zoo for breakfast with the orangutans! This award winning wildlife attraction is the only place in the world where you can dine with these loveable hairy beasts. Sadly we ran out of cash, so weren’t able to do this particular activity, but we had to include it anyway as it would be an incredible experience. Tickets cost $35 for an adult. What better way to round off your 24 hour airport stopover in Singapore! An extra day allows you to do all of the above and explore more of Singapore’s lush green spaces. 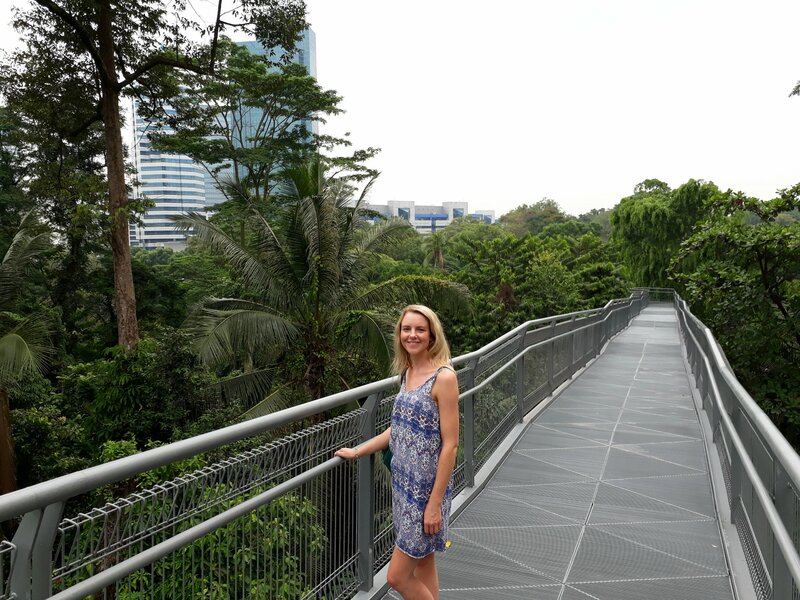 Start the day with a walk along the Southern Ridges, a 10km elevated trail which winds its way through the city, connecting Singapore’s most popular parks and gardens. The views are spectacular and you might even spot a monkey in the trees. 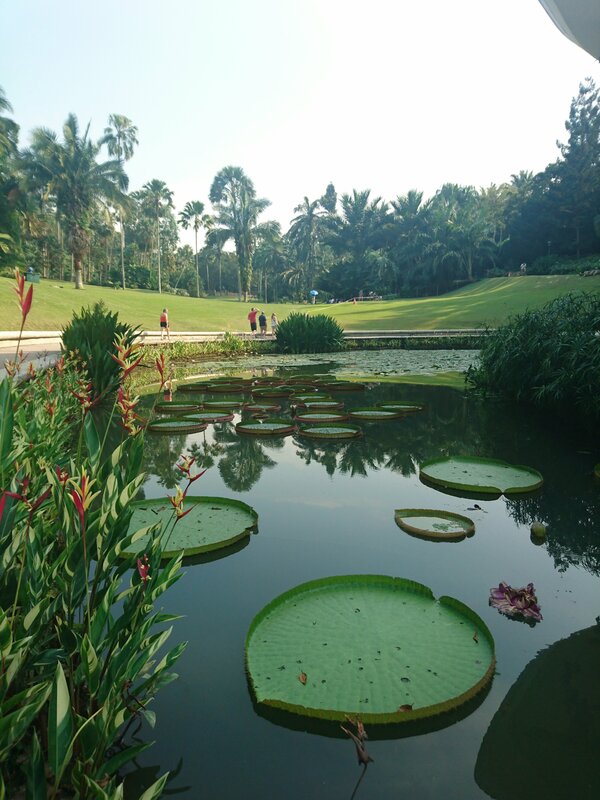 Afterwards spend the afternoon relaxing and picnicing in Singapore’s beautiful Botanic Gardens which boast a picturesque lake full of turtles and some huge Jurassic Park style lily pads among other horticultural treasures. Then return to your city centre pad for a final evening gorging on any favourite western foods you might have been missing during your South East Asian travels. We were craving Kelloggs Cornflakes but be warned, like everything else in Singapore they were seriously expensive at around £6 a box. Totally worth it though! So there it is: our guide to making the most of an airport stopover in Singapore. If you have any travel tips to share on how to spend a couple of days in this exciting city let us know in the comments below! Singapore – the colonial design of the Raffles Hotel, modern skyscrapers, rooftop pools and light shows all accompanied by a Singapore Sling. Sounds good to me! Breakfasting with orang-utans, giant lily pads, treetop canopy walks. I hope travellers read your blog and make the most out of their 8/24 hours stopover in Singapore.